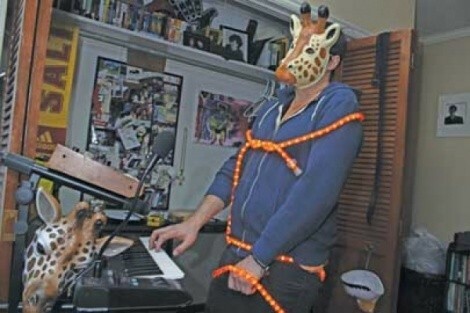 Watching Giraffula’s first music video, “Remembrances,” a few insights about the man behind the show become clear: When performing, in video and onstage, Seth Cook likes to wear animal masks and ’80s-era Budweiser short shorts and display rope lighting, world globes and loops. Not loops of fabric—though he always performs on a living-room rug—but digitally captured loops of sound. One night at The Urban Lounge, when I stumbled upon the one-man band, said accoutrements, albethey odd, shared the stage with guitars, synthesizers, multiple microphones and cabinets, from which a full-band-size sound started trickling from the speakers and stage behind me. A rhythm, guitar noises and vocals all began to build like they “normally” would. When I turned around, I saw that not only was the rug occupied by one costumed guy, but that all the sounds were also coming from just one person. I was shocked and immediately grateful. Really diverse sounds—Jesse Cassar, co-founder/organizer of the 2011 inaugural Crucial Fest, among other musically active titles, says this of Cook: “He’s a great musician and extremely innovative. Salt Lake City needs more experimentation when it comes to one-man bands.” He adds that after several national tours as a band manager, he hasn’t heard about, or run into, anyone quite like Cook, except rare instances in bigger towns. It seems only far-flung artsy places are tapping into whatever creative, new zeitgeist Cook is feeding off of. But that’s just fine; SLC can use more innovation. It hasn’t been an easy road to Giraffula’s upcoming show. It would be tempting to make metaphors about sports-fan Cook’s “bench warming” and recovery from the recent shoulder surgery that removed him from some of the fall season’s musical action—but I won’t. Cook was gaining steam and steadily performing with some regularity until an old, but newly aggravated, shoulder injury put his project on hiatus. Now, Cook is healing up nicely and can finally hold his guitar without wincing in pain, and it seems he is on his way to a solid musical slam dunk in December (sorry ... couldn’t resist). As Cook mentioned before, he’s mostly “musician” in his project, though his “shtick” is evident. Yet it isn’t a necessary part of the process—it’s just that Cook hasn’t found musicians he jells with. Though he has tried, and is trying, to round out his roster. “I’m looking into playing with people, creating a more full-band style, but [this project is] more complicated.” Cook says. Cook’s is a fully fleshed-out sound, as loud and lush as any symphony—all thanks to modern technology. We really live in a world where one person can create a whole lot of sound onstage, and, for SLC’s sake, I hope Cook never finds anyone else to play with, because all he really needs is a mouth and a loop pedal—in addition to a giraffe mask and Budweiser shorts, of course.